Our church ‘plant’ was formed as a separate congregation from Leamington Road in 1995. This congregation meets on Sundays at 10am at the Church Hall on Lonscale Drive, Styvechale Grange for worship which is relaxed and very welcoming. Some provision is made for children at all services. In addition to the main church, St James, on Leamington Road, Styvechale Grange has its own local church situated in Lonscale Drive. The church is a very welcoming, caring and lively family congregation withservices having a mix of modern and traditional music. Most of our services are Morning Worship, but we also have Holy Communion services too. As part of our desire to reach out to the community, the Church also runs a weekly Christian playgroup (every Wednesday) for children below school age. 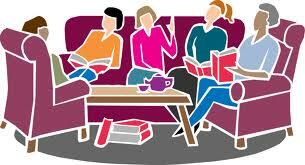 We also run a monthly Tea & Chat open session to enable both local residents and congregation members to meet socially. Has children attending from a wide mix of faiths or none. All are welcome. The group meets on Wednesday mornings (9:30am to 11:30am) during school term times. Children must be accompanied by an adult. A small charge, currently £1.50 per week, is made to cover the cost of refreshments provided for both carers and children. For the children there are toys, arts and crafts, and the opportunity to play with other children and make friends - there will be some limited religious themes to certain activities..
For carers we hope to provide good tea and coffee, good company and a listening ear if one is needed. For further information on this well attended group please contact Christine Binks on 76503704 or our Parish Office on 76692299.
meets on the third Friday of each month at 2:30pm at The Grange. The reading material is very varied and provokes some interesting discussion. The Grange prayer meeting takes place on the second Monday of each month at 2:45pm. Anyone is welcome to join us to pray.